This past weekend MSC Cruises marked a major milestone as part of its partnership with Cirque du Soleil. 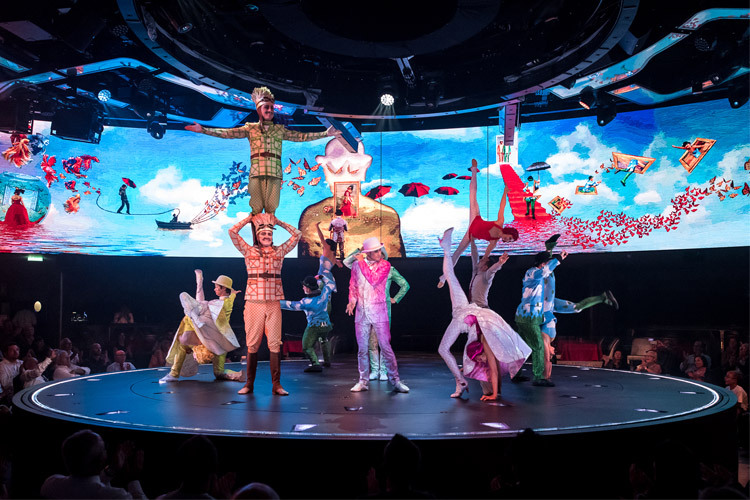 Both companies celebrated the 1,000th performance of the exclusive Cirque du Soleil at Sea shows on board MSC Meraviglia, which first launched in June 2017. Viaggio: The story of a passionate and eccentric artist who hears the call of his Faceless Muse. Mysterious and seductive, she beckons him into the vivid world of his unbridled imagination to complete his masterpiece. With each stroke of his paintbrush, the Painter reveals the details of his grandiose tableau. Electrifying colours fill the space with intriguing motifs and rich textures. Majestic acts transform the theater into a living canvas. Sonor: This show takes guests on an auditory adventure with dancers, acrobats and characters, all moving to the rhythm. It conjures a world of unique sensations, astonishing sounds, bold music and immersive projections and culminates in a grand finale for the senses. Oct. 8, 2019: A 10-night sailing embarking from New York City sailing to destinations in Canada, including Sydney, Nova Scotia; Corner Brook, Newfoundland; Charlottetown, Prince Edward Island; and Quebec City, Québec. Prices start at $1,229 per person for a balcony stateroom. Oct. 18, 2019: A 10-night sailing embarking from New York City and sailing to Bar Harbor, Maine; St. John, New Brunswick; Halifax, Nova Scotia; Sydney, Nova Scotia; Portland, Maine; and Boston. Prices start at $1,169 per person for a balcony stateroom. Oct. 28, 2019: A 13-night sailing embarking from New York City and sailing to Philipsburg, St. Maarten; Fort de France, Martinique; Bridgetown, Barbados; Saint George, Grenada; Willemstad, Curaçao; Willemstad, Curaçao; Ocean Cay MSC Marine Reserve; and ending in Miami, Florida. Prices start at $1,559 per person for a balcony stateroom. This month MSC Cruises also launched its latest flagship and MSC Meraviglia’s sister ship, MSC Bellissima, complete with two exclusive Cirque du Soleil shows: Syma and Varelia. Every element of each show is unique, from the concept and storyline, characters, costumes and make-up to music, staging and sound effects. Each show offers a true multisensory experience that will leave guests spellbound. Syma: Sail beyond Imagination takes you on the epic journey of a young sailor, brimming with imagination. On this bold expedition, he braves the elements, plunges into troubled waters and discovers the mysterious island of his dreams, populated by surreal, and colorful creatures. We all carry our own imaginary island inside of us, so what are you waiting for? Syma awaits. Immersive video images, an original set design, bioluminescent lighting and acrobatic feats make Syma an unforgettable show. Varelia: Love in Full Color puts a futuristic twist on a traditional medieval tale. It traces the arduous course of an unconventional courtship between a princess with distinctive violet skin and a charming hero who is blind. Their budding romance is thwarted by a villain who, in a fit of madness, kidnaps the royal. With the help of his friends, the brave young hero formulates a plan to rescue his beloved. Delight in the acrobatic feats, the laser show and the unique set design of this futuristic medieval tale. Work is already well under way for the next two original shows to debut on MSC Grandiosa, launching in November this year and another two new shows for MSC Virtuosa, launching in October 2020. Cirque du Soleil at Sea is a pre-booked experience for guests with competitive rates and can be booked in advance or while on board during the cruise if availability allows. Guests can either book to enjoy a three-course menu served before the show ($39) or sip on a specialty cocktail ($17) and enjoy the pre-show that begins 30 minutes before the start of the Cirque du Soleil at Sea performance. For more information, click on MSC Cruises.